Start off your visit on the 7th (Sun): make a trip to Journey Behind the Falls, make a trip to Horseshoe Falls, and then admire the sheer force of Niagara Falls. For ratings, maps, more things to do, and other tourist information, you can read our Niagara Falls trip planner . Dryden to Niagara Falls is an approximately 12.5-hour flight. You can also drive. Traveling from Dryden to Niagara Falls, you'll lose 1 hour due to the time zone difference. Expect a bit warmer temperatures when traveling from Dryden in July; daily highs in Niagara Falls reach 32°C and lows reach 20°C. Finish your sightseeing early on the 7th (Sun) so you can drive to Toronto. Start off your visit on the 8th (Mon): explore the historical opulence of Casa Loma, then contemplate in the serene atmosphere at St James Anglican Cathedral, and then take a stroll through The Distillery District. 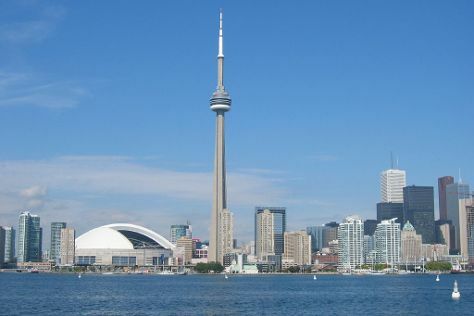 Here are some ideas for day two: see the interesting displays at Royal Ontario Museum, then see the interesting displays at Hockey Hall of Fame, and then enjoy breathtaking views from CN Tower. Quickly create a custom-made itinerary for Toronto using our trip planner. Traveling by car from Niagara Falls to Toronto takes 1.5 hours. Alternatively, you can take a bus; or take a train. July in Toronto sees daily highs of 31°C and lows of 20°C at night. Wrap up your sightseeing on the 9th (Tue) early enough to travel to Ottawa. Start off your visit on the 10th (Wed): take in the spiritual surroundings of Notre Dame Basilica, see the interesting displays at National Gallery of Canada, and then contemplate the long history of Parliament Hill and Buildings. Get ready for a full day of sightseeing on the 11th (Thu): take a stroll through ByWard Market, then get engrossed in the history at Canadian Museum of History, and then hike along Rideau Canal. To find maps, reviews, where to stay, and other tourist information, use the Ottawa online route planner . Fly from Toronto to Ottawa in 3 hours. Alternatively, you can take a train; or drive. Expect a daytime high around 30°C in July, and nighttime lows around 18°C. Finish your sightseeing early on the 11th (Thu) to allow enough time to take a train to Montreal. On the 12th (Fri), take in the architecture and atmosphere at Notre-Dame Basilica, take a stroll through Old Port of Montreal, and then contemplate in the serene atmosphere at Saint Joseph's Oratory of Mount Royal. For reviews, photos, where to stay, and other tourist information, use the Montreal online visit planner . Traveling by train from Ottawa to Montreal takes 2.5 hours. Alternatively, you can drive; or take a bus. In July, daily temperatures in Montreal can reach 30°C, while at night they dip to 20°C. Wrap up your sightseeing on the 12th (Fri) early enough to travel to Vancouver. Start off your visit on the 13th (Sat): tour the pleasant surroundings at Kitsilano Beach, then wander the streets of Granville Island, and then contemplate the waterfront views at English Bay. Here are some ideas for day two: walk around Stanley Park and then explore the wealth of natural beauty at Shannon Falls Provincial Park. Make your Vancouver itinerary with Inspirock to find out what to see and where to go. You can fly from Montreal to Vancouver in 7 hours. Alternatively, you can drive; or do a combination of train and car. You'll gain 3 hours traveling from Montreal to Vancouver due to the time zone difference. Traveling from Montreal in July, expect little chillier with lows of 17°C in Vancouver. Wrap up your sightseeing on the 14th (Sun) early enough to fly to Victoria. On the 15th (Mon), add some adventure to your tour with a kayaking and canoeing tour, then explore the engaging exhibits at Miniature World, and then glide peacefully along the water with some of the best stand-up paddleboarding in the area. Here are some ideas for day two: admire the natural beauty at The Butchart Gardens, then get up close to creatures of the deep with a dolphin and whale watching tour, and then take in the exciting artwork at Old School Gallery & Gifts. For photos, more things to do, reviews, and more tourist information, go to the Victoria travel route site . You can fly from Vancouver to Victoria in an hour. Other options are to ride a ferry; or do a combination of car and ferry. Expect slightly colder weather when traveling from Vancouver in July: highs in Victoria hover around 22°C, while lows dip to 15°C. Finish your sightseeing early on the 16th (Tue) to allow enough time to travel to Banff National Park. Step out of the city life by going to Takakkaw Falls and Johnston Canyon. Explore hidden gems such as Fairmont Chateau Lake Louise and Natural Bridge. Take a break from Banff National Park with a short trip to Emerald Lake in Yoho National Park, about 36 minutes away. Next up on the itinerary: cruise along Bow Valley Parkway and explore the activities along Moraine Lake. To find where to stay, reviews, and more tourist information, go to the Banff National Park tour planning website . You can do a combination of bus, flight, and shuttle from Victoria to Banff National Park in 9 hours. Alternatively, you can do a combination of flight, shuttle, and bus; or do a combination of ferry and car. Due to the time zone difference, you'll lose 1 hour traveling from Victoria to Banff National Park. Traveling from Victoria in July, expect slightly colder with lows of 6°C in Banff National Park. Finish up your sightseeing early on the 19th (Fri) so you can travel back home.